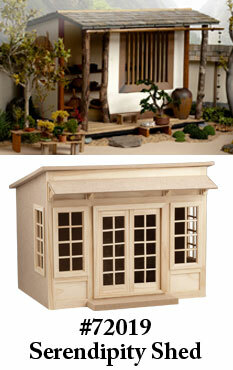 We're so excited about this year's Creatin' Contest kit, the Serendipity Shed Kit! Charmingly compact but packed with charm, the Serendipity Shed offers just enough room for creativity without cramping your creative space. Open its doors to all the options a small space can become: Tiny little tea shoppe? Bijoux boudoir? Fishing shack? Fruit market? Exercise your imagination and explore all that Serendipity can be. Creativity, originality and craftsmanship go into all the winning entries; are you up for the challenge? Grand prize is a $1,000 HBS/miniatures.com gift certificate. Three runner-up gift certificates are awarded ($500, $350, $250) plus up to $1,000 in gift certificates divided among the top first-time entrants. All entrants receive a “thank you” prize. An entry form is included with each Serendipity Shed Kit. Deadline for entry is Monday, December 16, 2019. Winners will be announced in mid-February 2020.